You are looking for placeholder graphics to prototype your game(s) and your graphic designer is reported missing? 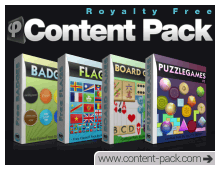 Royalty Free Content Packs is a marketplace to download affordable game art & ready-to-use graphics. This is one of our games, pretty cool huh! © Copyright 2019. Organic content by Naaty Design. Use of any graphics is expressly forbidden without prior consent.